My mom Genny will be the first to admit that she’s not Betty Crocker. She certainly bakes with Betty’s help though, employing boxed mixes or pouches that require only an addition of eggs and water to produce whatever cookie, cake, or treat she wishes to make. Genny’s recipe for peanut butter cookies involves a box of yellow cake mix, peanut butter, a few eggs, and probably some oil. I’m not sure where she got this recipe, or why cake mix is involved, but it turns out a pretty tasty cookie. Especially when a Hershey’s Kiss is plopped in the middle. 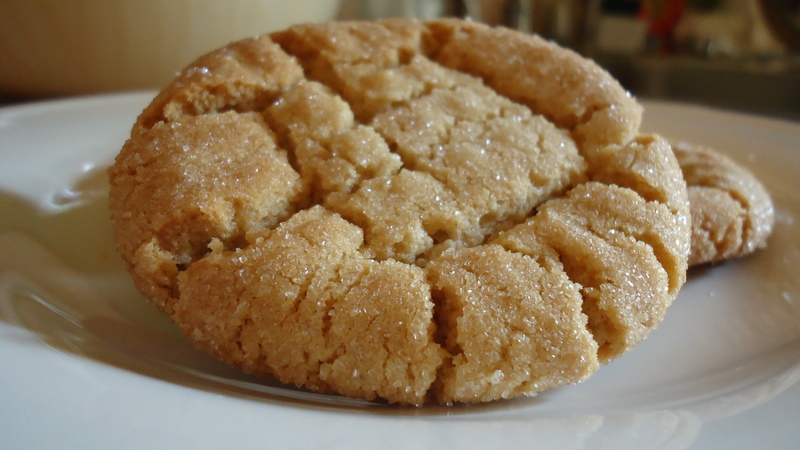 The recipe below yields a classic homemade peanut butter cookie and isn’t meant for the Hershey’s Kiss; that recipe requires a slightly sturdier dough made with shortening and a different quantity of flour. If you want to get creative with this recipe, try pressing some milk chocolate chips into the tops of these cookies when they are right out of the oven. In a mixing bowl, combine butter and peanut butter; beat on medium speed for 30 seconds. Add sugar, brown sugar, baking soda, and baking powder; beat until combined. Scrape down the sides of the bowl and add the egg and vanilla; beat until combined. Add flour and beat until combined. Using a one-inch cookie scoop, scoop out dough and roll into balls, then roll in granulated sugar. Place on an ungreased cookie sheet about 2 inches apart, then press a crisscross pattern into the top of each cookie with a fork. Bake for 8-10 minutes, until just golden brown. The centers of the cookies should still be puffy and look somewhat raw; that’s okay, as they’ll continue to bake as they cool on the baking sheets. Cool on the baking sheet for a few minutes, then transfer to a wire rack to cool completely.